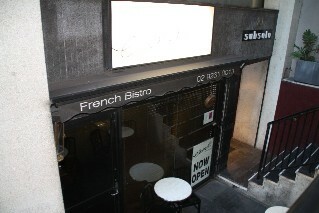 La Guillotine French Restaurant (reviews) 518 Kent St Sydney Ph: 9264 1487. Located right behind the cinema complex on George St. Operating since 1967, over 44 years. Open Mon to Fri 12pm - 3pm and 5.40pm - 10.30pm. Open Sat 5.30pm - 10.30pm. Closed on Sunday. For restaurant reviews for La Guillotine French Restaurant click here. Guillame at Benelong located at the Sydney Opera House with great views over the harbour. CJ's French Fondue Restaurant 99-111 Military Rd Neutral Bay just 10 minutes from the city by taxi across the harbour bridge. Marque Restaurant 4/5 355 Crown St Surry Hills. 5 minutes from the city by taxi. Tabou Restaurant (reviews) 527 Crown St Surry Hills Ph: 9319 5682. Open for lunch Monday to Friday. Open for dinner 7 nights. For restaurant reviews for Tabou French Restaurant click here. 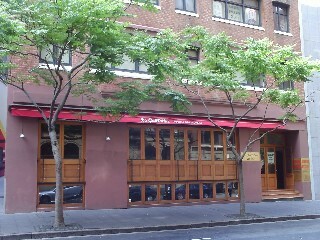 Apres French Restaurant 32 Orwell St Potts Point. 10 minutes from the city by taxi. Aperitif French Mediterranean Restaurant 7 Kellet St Potts Point Ph: 9357 4729. Open every night except Tuesday 5.30pm till 3am. Monday until midnight. Claude's 10 Oxford St Woollahra. 15 minutes by taxi from the city. Larousse French Restaurant (reviews) is a licensed and BYO (wine only) restaurant located at 352 Bay St Brighton-le-Sands Ph: 9597 4010. Open Mon - Sat from 6pm till late. For restaurant reviews for Larousse French Restaurant click here. 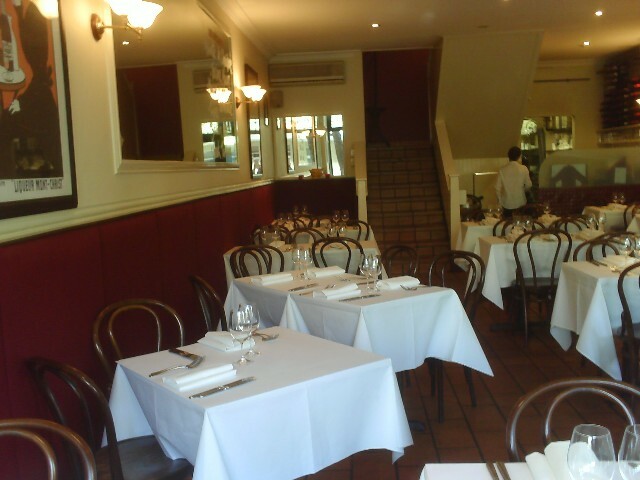 Balzac French Restaurant 141 Belmore Rd Randwick 15 minutes from the city. 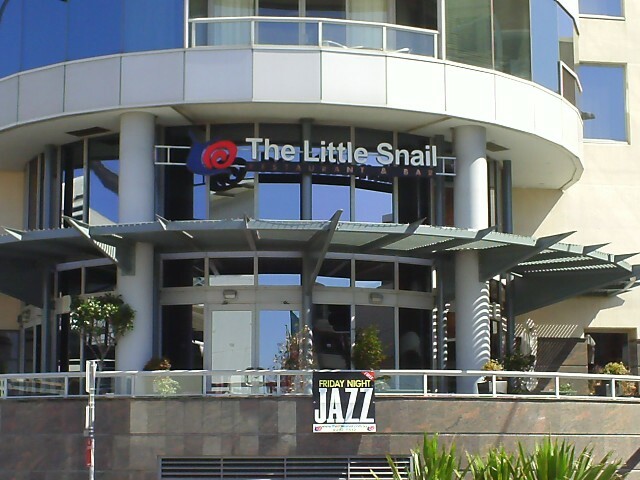 The Little Snail French Restaurant (reviews) 50 Murray St Pyrmont Ph: 9212 7512. Operating since 1966. Right next to Darling Harbour. Live Jazz music every Friday night. 3 course dinners from $55. 3 course lunch menu from $35. For restaurant reviews for The Little Snail French Restaurant click here. Element Bistro (reviews) 163 King St Sydney Ph: 9231 0013. Open for lunch Mon - Fri 11.45am - 3pm. Dinner Tues - Fri from 5.45pm till late. For restaurant reviews for Element Bistro click here. Baroque Bistro 88 George St Sydney. Located within the Rocks. Ph: 9241 4811. A great traditional French Bistro with no main meals over $29. Meals include ocean trout with carrot puree $24, duck with baby vegetables $29, lamb shoulder with white bean puree $25 or the classic steak with fries $25. Starters include mango and poached chicken salad $16 or the salad with crunch garlic croutons $6. Desserts $13. Bilson's Restaurant Radisson's Hotel 27 O'Connell St Sydney. An award winning restaurant serving modern French cuisine. Glass Brasserie Level 2 488 George St Sydney, inside the Hilton Hotel. La Brasserie 118 - 126 Crown St Darlinghurst. 5 minutes away from the city. Le Pelican French Mediterranean Cuisine. 411 Bourke St Darlinghurst Ph: 9380 2622. Open for lunch Monday to Friday 12 - 3pm. Open for dinner Tues to Sunday 6pm - 10pm. Onde Restaurant 346 Liverpool St Darlinghurst Ph: 9331 8749. Open 7 days from 5pm. Manu at L'Etoile 211 Enmore Rd Paddington Ph:9332 1577. The chef is the 3-hat celebrity Manu Feidel. Open for lunch Fri-Sun and dinner 7 nights. Roberto's Restaurant serving French/Italian cuisine. 28 Bay St Double Bay Ph: 9327 1470. Open 7 days for lunch and dinner. 12 noon - 11pm. Restaurant Atelier serves modern French cuisine. 22 Glebe Point Rd Glebe. Ph: 9566 2112. Open 6pm Tuesday to Saturday. A'Mews serves modern French and British food. 99 Glebe Point Rd Glebe. Ph: 9660 4999. Open for lunch on Friday and dinner Tuesday to Saturday. 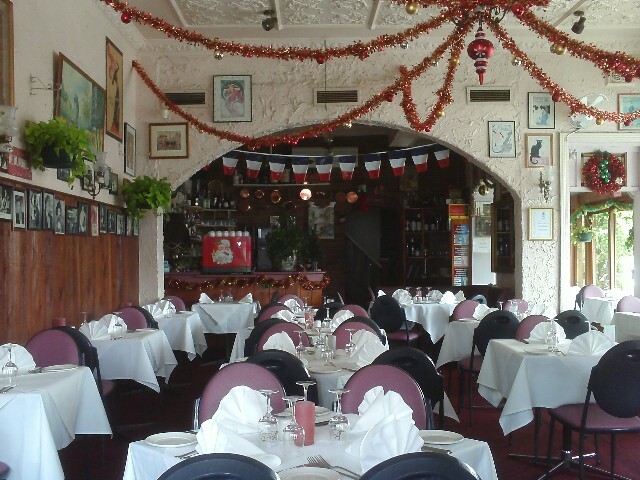 La Grand Bouffe 758 Darling St Rozelle, 10 minutes by taxi from the city centre.